The Barbie doll made her first appearance on March 9th 1959, produced by American company Mattel. Ruth Handler co founder of Mattel and the designer of Barbie envisioned creating a teenager version of a baby doll after watching her young daughter Barbara play only with paper dolls. This sparked an idea of creating a 3D plastic doll that appealed to older children because at the time no teenage plastic doll existed. Barbie, short for Barbara Millicent Roberts, named after Ruth Handler’s daughter debuted wearing a black and white swimsuit, gold hoop earrings and high heels. Made from plastic she stood eleven and a half inches tall and weighed less than half a kilo. Barbie became the first plastic American doll that looked and had the body of an adult. Due to this, the public were at first horrified to think young children would be playing with a doll with real womanly features although Mattel had already thought up a marketing plan. Over the next few years this plan would send Barbie sales skyrocketing and continues to hold a large portion of the doll sales marketplace today. New Barbie dolls are produced each and every year often reflecting the era in which they were produced by sporting iconic pieces of clothing or looking similar to familiar faces from that decade. Barbie has had over 180 different careers and sported hundreds of different outfits over the past fifty years, although has still remained a popular young child’s favorite doll. Today, worldwide Barbie dolls have become collectible items, in particular the vintage range produced up until 1973. Some selling for hundreds of thousands of dollars, this article will highlight just a few of the most iconic Barbies from the last six decades. During 1959, these dolls were manufactured in Japan made from vinyl plastic designed by the Mattel corporation. Approximately 350,000 of these first ever Barbie dolls were sold to the public. This Barbie doll was available with either blonde or brunette hair, both styles wearing a black and white swimsuit created by Charlotte Johnson. During 1959 these Barbies would sell for $3.00 although today their value has significantly increased and they are worth upwards of $3,000. The better the condition of the doll, the number of accessories and if the box is intact determine the exact price of the individual doll. Below are the two types of Barbies that were available during 1959. Known as vintage Barbie dolls up until 1973, the Fashion Queen Barbie produced in 1963 and The American Girl Barbie produced in 1965 were iconic dolls from the 1960’s. 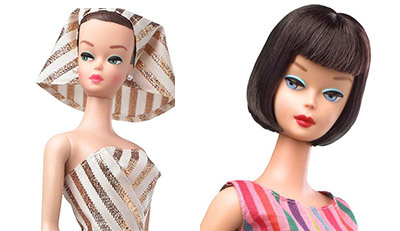 Both very different, the Fashion Queen Barbie came with three wigs which highlighted the popularity of wigs during this era where as the American Girl Barbie has a straight cut bob and elegance appealed to young girls in the 1960’s. The Fashion Queen Barbie is remembered for her interchangeable wigs and her matching gold and white swimsuit and turban. She had blue eyes and her brown hair was painted on her scalp so that the wigs could be easily put on. This Barbie today can be purchased for upwards of $300 although a replica of this doll produced by Mattel in 2010 named My Favorite Barbie Fashion Queen Reproduction can be purchased for approximately $50.00. The American Girl Barbie previously sold under the name The Bendable Leg Barbie wore a striped colorful swimsuit which had a turquoise bottom on it which matched turquoise open shoes. This Barbie has become a collector’s favorite due to its glamour and the differing number of hair colors available to choose from. Today, this Barbie in particular is one of the more valuable collectors items selling upwards of $300 depending on condition. Recently just the box this Barbie doll came in was sold for $200. A change in Barbie’s appearance was notable during the 1970’s when her hair changed from popular 1960’s short styles to long straight blonde hair. The eyes on previous Barbie dolls were looking towards the side now looked straight onwards and her once shut mouth now opened so that one could see her pearly white teeth. In 1971, the Sunset Malibu Barbie doll hit the shelves and appeared quite different to the Barbies sold the decade previous. Towards the end of this decade in 1977 Mattel produced the popular Superstar Barbie who had blue shimmer eye shadow and clothes that reflected the disco feel during the 1970’s. The Sunset Malibu Barbie Doll had tanned skin and wore a one piece blue swimmer and came with a yellow towel and purple sunglasses. 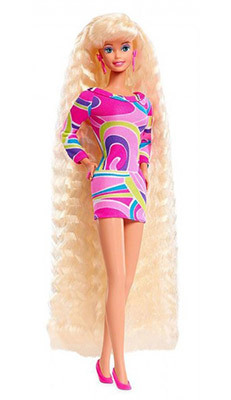 This Barbie has long blonde hair and represented a typical ‘Californian Look’ which many young girls aspired to have. She had a Stacey head style which was quite different to the previous faces of Barbie. This new look is similar to the Barbies that are sold today. This Barbie doll today can sell for upwards of $200.00. The Superstar Barbie had long curly blonde hair parted on one side and sported an open mouthed smile. She wore a hot pink satin dress and earrings and a ring which could be removed. The Superstar Barbie also came with a necklace for the purchaser to wear which gave young children an incentive to buy her. The superstar Barbie is today worth over $300.00. The 1980’s brought with it many different styles of Barbies and during this decade the first black African American Barbie Doll was also produced. In 1985, The Day to Night Barbie influenced by an era of many more women entering the workplace was produced followed by the 1988 popular Holiday Barbie. The Barbies produced in the 1980’s were a direct reflection of the time period in which women were gaining more rights in the workplace and with this came multiple working Barbies including an astronaut, a pilot and a doctor Barbie Doll. The Day to Night Barbie had blonde hair and wore a pink suit and carried a matching pink suit case. This Barbie also came with an evening gown and highlighted that women were now a big part of the workplace. This Barbie can sell for upwards of $100.00. 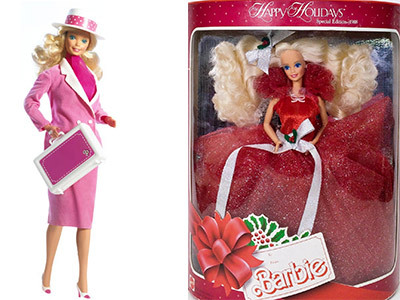 The Happy Holiday Barbie produced in 1988 was the first doll produced in this Barbie collection. She wears a red tulle dress and has long blonde hair with a silver bow. These Barbies were extremely popular as they were released at Christmas each year and today are some of the more valuable collectors items. The 1988 Holiday Barbie Doll can be worth as much as $750 if in immaculate condition. Fashion was very popular in the 1990’s and with this came the most popular Barbie to be produced to date called the Totally Hair Barbie. Over ten million Totally Hair Barbie dolls were sold worldwide and have the record for the longest selling single toy from the years 1992 to 1995. This doll made during 1992 had the longest hair out of all the Barbies. Crimped and blonde, this Barbie’s hair almost reached her toes and is ten and a half inches long. She wore a micro mini multicolored dress which had a waist belt attached. She came with a comb and five hair accessories to style her long hair as well as styling gel. In 1992 this Barbie doll sold for almost $12.00 although today is worth over $160.00. Twenty five years later, due to the popularity of this doll Mattel produced an anniversary totally hair Barbie doll priced at $24.95 that includes similar features to that of the original Totally Hair 1992 Barbie. By 2000 Barbie had changed her style completely compared to the Barbies produced in the 1990’s. Barbie was now super flexible and also had a belly button for the first time. Her makeup was less bold and more natural and her waist was now able to be bent. The 2000’s also held the 50th anniversary for Barbie and a breakup from former boyfriend Ken which highlighted a period where many real life celebrity couples were divorcing. The Barbie 2000 collector’s edition is one of the more popular Barbies produced in this decade. 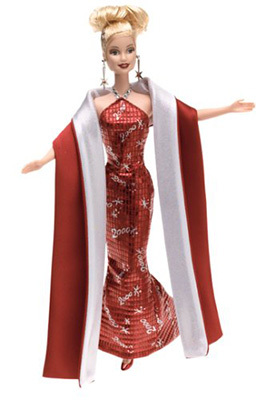 This Barbie wears a red and silver dress has dangling star earrings and her blonde hair is up in a bun. This Barbie Doll produced to bring in a new decade and the year 2000 can sell for approximately $50. Even today Barbie Dolls are still as popular as they were when they were first produced in 1959. Sold in over one hundred and fifty countries worldwide and approximately three dolls sold every second it’s no wonder that Mattel are still producing new dolls each and every year. Although their styles, jobs and lifestyles have changed over the years the dolls still remain a children’s favorite as well as popular collectors items.